Maju Assets Sdn Bhd, the property arm of diversified Maju Holdings Sdn Bhd, is upbeat its RM1.3 billion mixed development in Sungai Besi, Kuala Lumpur will appeal to buyers. The project, called Infinity, is in planning stage and will be launched by the end of next year. It will comprise a four-star hotel, officer towers, serviced apartments and retail, sprawled on 6ha. Maju Asset managing director, Adam Radlan Adam Muhammad (left) said the project will be attractive because of its concept, location and connectivity. 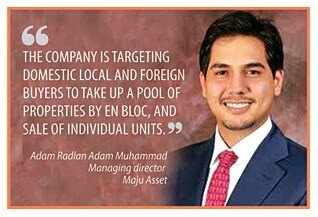 Radlan said in an interview with Business Times in Kuala Lumpur recently that the company is targeting domestic and foreign buyers to take up a pool of properties by en bloc, and sale of individual units. "When we buy land, we make sure the area has good connectivity. We find that this is what buyers wants. As a developer, we have to look into that," he said. "All our projects are devoted to creating developments of unrivalled quality in the country's most desirable locations, and adhering to the concepts of sustainability and community," he added. Infinity, when completed in about three years, will have access to Sungai Besi Highway, Bukit Jalil Highway, Kuala Lumpur-Putrajaya highway and Kuala Lumpur-Seremban expressway. Radlan said Maju Assets will spend RM25 million to improve the access to these highways as well as build a flyover from the Seremban highway exiting Kuala Lumpur. Maju Assets also has 6ha in Sg Besi earmarked for an industrial project. It will be launched by mid-2012. Radlan said the company plans to build warehouses and medium-sized factories with modern facilities, targeting multinational companies and local small and medium enterprises. "The southern part of Kuala Lumpur is booming. A lot of property developers such as YTL Group are heading there. So we are bullish on both the projects," Radlan said.